The big day is coming; as it is every year, September will bring a new FIFA title to soccer aficionados all over the world. This year is no different. Two weeks before the release, everyone can have a look at what FIFA 18 will bring. As confirmed, not only by its success, FIFA 17 was a very good game. It was so good that it’s hard to believe that a game can improve significantly only one year apart. The demo sort of confirmed this impression. Please note that the review and the screenshots are based on the Xbox One version. 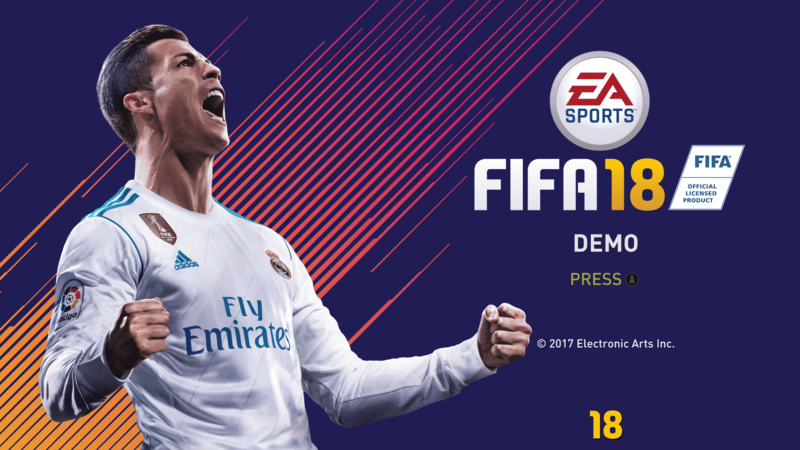 The FIFA 18 demo will allow you to play with twelve clubs. C.D. Guadalajara (Mexico) e Vissel Kobe (Japan). You can enjoy also enjoy four stadiums: Santiago Bernabéu, La Bombonera, Los Angeles’ StubHub Center, and King Fahd Stadium. In addition, you have two modes at your disposal: Kick-Off (exhibition off-line game) and The Journey. The stunning graphics of FIFA 17 were improved for the FIFA 18. You should expect the best from FIFA and EA Sports delivers big time. The Frostbite engine allows for an incredible detailed players and other stunning visuals. Players’ appearance is very realistic for the most known players as well the less famous. Jerseys are up-to-date and incredibly detailed. With that being said, as you can see from the screenshot that games in night mode are a bit dark. If you compare it with real games, especially in big games like the Champions League, the picture is usually brighter. That, however, will not pose a threat while you actually play, it’s mostly a glitch on animations. No one can deny that graphics are stunning and even better than FIFA 17. However, there a couple of flaws. The first thing is the impact given by the two huge EA Sports ad-like signs next to the nets. Not only they are too big, but they don’t really fit the rest of the stadium graphics. The second thing is the stadium atmosphere. 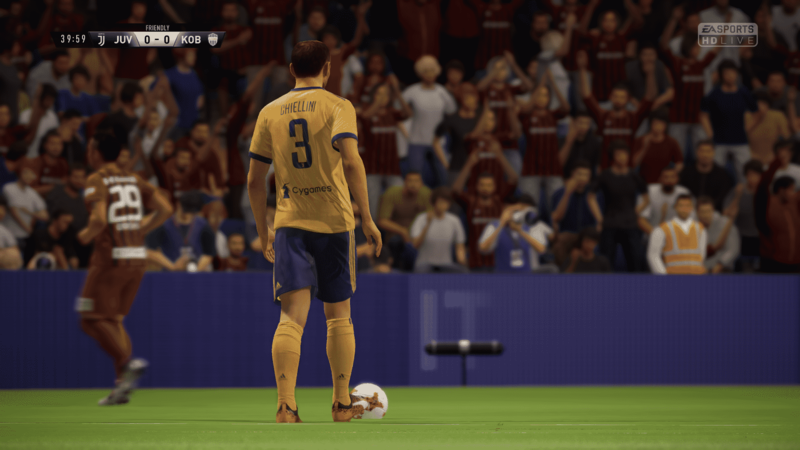 Having some jerseys and banners isn’t going to add much to the game and the crowd seems a step behind if compared with the stunning graphics of the players. 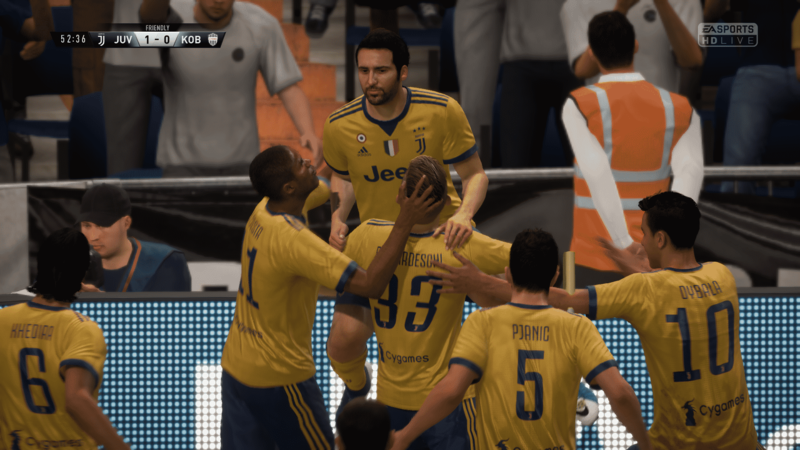 In terms of gameplay, FIFA 18 really plays in a much similar way to its predecessor. It’s not necessarily a bad thing as FIFA 17 was a solid soccer simulation. The game seems to be more physical with bigger players having an edge in certain moments. The speed continues to be a very important attribute. Physics are realistic, the ball feels heavy enough, and bounces are realistic. Even when players are closely fighting for the possession. Tactics are as important as they are in a soccer simulation. You can set your team with a good degree of freedom, but not as much as other titles let. This is, however, is only a minor complaint as you can still do many adjustments. The advanced controls allow for a deeper tactical experience. Players do feel different, especially when defending against the fastest and most skilled players. You can have a taste of the second season of The Journey. 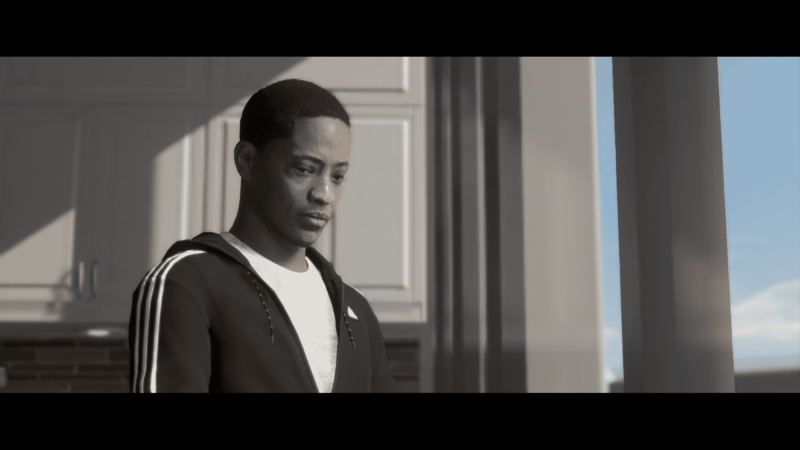 It will hardly keep up with the first season, but now Alex Hunter is on the verge of moving teams and you’ll have to gain the love of your fans back. If you like this storytelling mode, then you should definitely have a try with Hunter Returns..
No game is perfect and neither is FIFA 18. While the game is very fluid and graphically stunning, the pace of the game still feels a bit too much. Maybe it’s not the up-and-down fest that sometimes FIFA notoriously gets associated with, but I think here EA Sports still has some work left. Passing is definitely improved. The killer through balls are now much less effective, especially when you try longer ones. There is probably still too much precision for both human players and the AI. 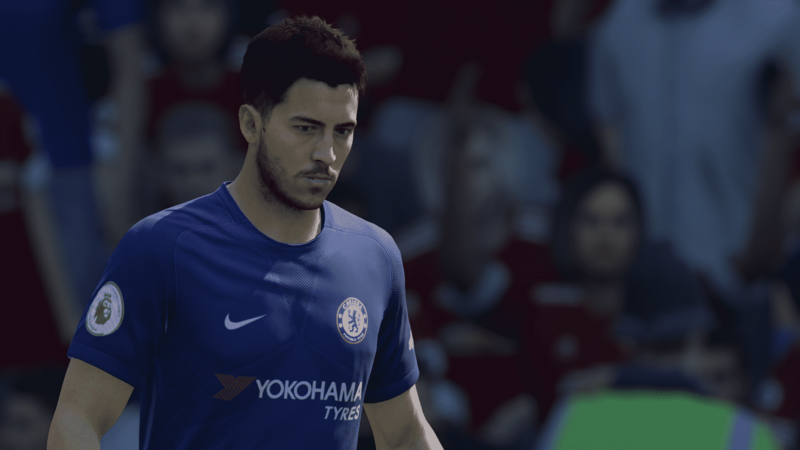 Quick subs are an interesting concept that seen the light for FIFA 18, but frankly, I have to say that while the idea is good, it does sound a bit dull once you actually hit the field. Pretty much you end up swapping a winger with another winger. To do something more advanced you need to pause anyway. Therefore the functionality would need more work to be actually useful. Goalies are good. They play consistently well if they are good or less well if they are more on the average side. The animations are nice and I haven’t seen anything bad in my time with the demo. However, it’s very hard to surpass the center field with a goal kick and this kind of kick should be longer at the biggest power, probably. Another aspect not too appealing is that I saw pretty much no fouls at all, not from myself, nor from the CPU. While you can’t have much in four-minute halves, after multiple games chances are good that you should have got at least a penalty kick, but this was not the case. 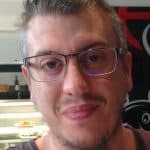 Perhaps the algorithm should be slightly changed in a future patch to allow fouls to actually happen during the games. It’s really hard to get to the conclusions with the FIFA 18 demo. On one hand, you can already understand that it will be a game with nothing short of outstanding graphics, excellent animations, and interesting modes. On the other hand, does it really differentiate from last year’s edition to justify the expense? With that being said, it should be noted that some of the baffles due to last year’s gameplay have been addressed. Passing and shooting are slightly improved, but the set pieces routine is the same as last year. The featured modes will likely make the difference in case of indecision.